Leeds, West Yorkshire 1732 and the winter has been hard. Many people have died from the bitter cold and others are starving to death for lack of food. The local chief of police or Constable as they were titled is Richard Nottingham. Married to Mary they have two daughters, one married - Rose, and Emily who has just left school. Rose however has recently perished after contracting a fever and wasting away. This obviously has put a strain on their marriage and Richard has worked hard to gain this important position. Born the son of a wealthy wool merchant, his mother had an affair with Amos Worthy a local procurer and pimp. The father threw out both mother and child, saying that he doubted the boy was his. Mother and son being destitute, she had to turn to prostitution whilst he begged and stole for food. Nottingham's right hand man is John Sedgwick. Nottingham is teaching him to read and write and is grooming him to eventually take over. John's wife left him with a young son when she ran off with a soldier. A local prostitute, Lizzie, moved in to live with them and has become both wife and mother. They have a few men under their command but the most reliable is a young boy, Joshua Forrester, once a cutpurse (pickpocket) who lives with Frances a young girl he protected. The city is starting to grow and wool merchants are rich and they expect the law to be on their side. The mayor Edward Kenion is very much their man. The rich have everything and the poor try to exist. When a local merchant is killed, Nottingham and Sedgwick reluctantly seek help from the influential Amos Worthy. Besides having to deal with this problem they have more trouble when two brothers, sons of an influential merchant, kill a popular clothes-seller. Can Nottingham bring them to justice? This is the second Richard Nottingham book from the author. He was born in Leeds but lived for 30 years in America. He is a music journalist, writing for the influential roots magazine fRoots, he has written several books about music and musicians. The latest about the late John Martyn. He has researched the period well with the help of the local Thoresby Society. It is interesting that many of the town centre streets still retain the same names today as two centuries ago. COLD CRUEL WINTER is rich with detail, particularly on the social inequalities. One amusing fact is that tea drinking then was very much a rich man's drink. Nottingham found it bitter and much preferred the ale which used to be drunk in preference. Presumably you couldn't trust the water but beer was brewed daily. COLD CRUEL WINTER is an interesting and enjoyable book. I will catch up with the first one and look forward to the third published next year. 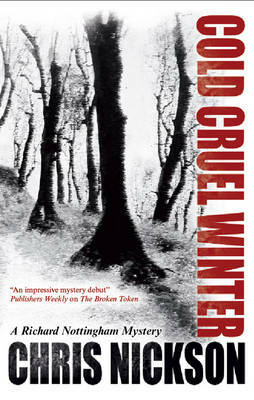 Read another review of COLD CRUEL WINTER.